Uriah T. Forney was born on 22 October 1853 at Stoyestown, Somerset Co., PA. He married Laura Melissa Tuttle on 1 December 1875 at Victor, Iowa Co., IA. Laura Melissa Tuttle was born on 13 January 1857. She married Uriah T. Forney on 1 December 1875 at Victor, Iowa Co., IA. [S792] Descendants of William Henry Ball and Mary Sweetser, William H. Ball and Mary F. Sweetser Family Bible (Cooperstown NY: H. & E. Phinney, 1843); present owner: David G. Ball (as of 21 April 2009), North Vancouver BC Canada. [S1724] New Hampshore Deaths 1654-1947, made available by FamilySearch.org (Salt Lake City, Utah) on-line at http://familysearch.org, 2012; database courtesy of The Church of Jesus Christ of Latter-Day Saints. [S10] 1880 (June 1) U.S. Census, Kingston, Rockingham Co., VT, ED 214, p. 22 (back of stamped 226). [S12] 1900 (June 1) U.S. Census, Plaistow, Rockingham Co., VT, ED 205, Sheet 9A (stamped 87). Albert H. Ball was born on 8 March 1865 at Haverhill, Essex Co., MA.1 He was the son of William Henry Ball and Mary Fremoyle Sweetser. Albert H. Ball married Ida M. Winn. Albert H. Ball married Lillian M. Glover. Albert H. Ball and Lillian M. Glover were divorced in 1910 at Rockingham Co., NH; for abandonment.2 Albert H. Ball died on 26 December 1943 at Brentwood, Rockingham Co., NH, at age 78. [S1803] Rachel Cerasuolo, "Albert Ball - email 01," e-mail message from Rachel Cerasuolo to David G. Ball, 30 July 2012. Rebecca Bigelow married Richard Cheever. Albert Sweetser married Rebecca Berry. 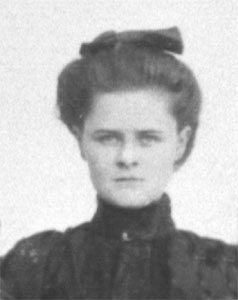 Rebecca Berry married Albert Sweetser. [S15] 1930 (April 1) U.S. Census, Pittsfield, Berkshire Co., MA, ED 2-55, Sheet 20A (stamped 36). Katherine (????) was born circa 1870 at England.1 She married Elon L. Hersey, son of Calvin A. Hersey and Martha Elmira Ball. [S14] 1920 (January 1) U.S. Census, Utica, Oneida Co., NY, ED 180, Sheet 15A (stamped 85). [S1535] "US WWII Draft Registration Cards", National Archives and Records Administration; on-line at Ancestry.com, accessed through www.ancestry.com. [S12] 1900 (June 1) U.S. Census, North Branch, Allegany Co., MD, ED 112, Sheet 5B (back of stamped 265). [S16] 1940 (April 1) U.S. Census, San Diego, San Diego Co., CA, ED 62-67, Sheet 5A (stamped 2043). [S13] 1910 (April 15) U.S. Census, San Diego, San Diego Co., CA, ED 140, Sheet 7A (stamped 7). [S15] 1930 (April 1) U.S. Census, San Diego, San Diego Co., CA, ED 37-110, Sheet 10A (stamped 276). Frances Todd is the daughter of Lumn T. Todd and Grace Laura Green. 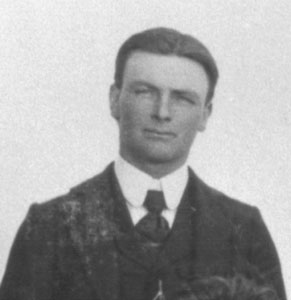 Guy Alfred Green was born circa 1904 at KS. He was the son of George A. Green and Bertha V. Ball. [S3183] Betsy Second, "Brown Family Tree a work in progress," database made available on-line courtesy of Betsy Second, https://www.ancestry.ca/family-tree/person/tree/15887020/person/20097220375/facts, database viewed 21 July 2017. [S13] 1910 (April 15) U.S. Census, Kinsley, Edwards Co., KS, ED 34, Sheet 4B (back of stamped 23). [S14] 1920 (January 1) U.S. Census, East San Diego, San Diego Co., CA, ED 241, Sheet 2A (stamped 101). [S1953] California County Marriages 1850-1952, made available by FamilySearch.org (Salt Lake City, Utah) on-line at http://familysearch.org, 2012; database courtesy of The Church of Jesus Christ of Latter-Day Saints. [S16] 1940 (April 1) U.S. Census, San Diego, San Diego Co., CA, ED 62-85A, Sheet 10B (back of stamped 2397). Earl Green was born circa 1910 at KS. He was the son of George A. Green and Bertha V. Ball. [S16] 1940 (April 1) U.S. Census, Riverside, Riverside Co., CA, ED 33-37, Sheet 1B (back of stamped 706). [S15] 1930 (April 1) U.S. Census, Melrose, Jackson Co., WI, ED 27-22, Sheet 1B (back of stamped 246). [S903] Find A Grave - A User-Contributed Listing of Cemeteries and Memorials; Find A Grave Founder Jim Tipton, 2009; online at http://www.findagrave.com/cgi-bin/fg.cgi?page=gs&, Melrose Cemetery, Melrose, Jackson Co., WI. [S14] 1920 (January 1) U.S. Census, Melrose, Jackson Co., WI, ED 57, Sheet 2B (back of stamped 152). [S16] 1940 (April 1) U.S. Census, Melrose, Jackson Co., WI, ED 27-23, Sheet 3A (stamped 181). [S3193] Bruce Hubbard, "The New Hubbard Family Tree," database made available on-line courtesy of Bruce Hubbard, https://www.ancestry.ca/family-tree/person/tree/28907585/person/12111628090/facts, database viewed 25 July 2017. [S12] 1900 (June 1) U.S. Census, Swan Lake, Emmet Co., IA, ED 74, Sheet 9A (stamped 24). [S13] 1910 (April 15) U.S. Census, Ellsworth, Emmet Co., IA, ED 86, Sheet 9B (back of stamped 194). [S15] 1930 (April 1) U.S. Census, Wood River, Burnett Co., WI, ED 7-23, Sheet 7A (stamped 282). [S16] 1940 (April 1) U.S. Census, Wood River, Burnett Co., WI, ED 7-24, Sheet 5B (back of stamped 153). [S12] 1900 (June 1) U.S. Census, Ellsworth, Emmet Co., IA, ED 76, Sheet 2B (back of stamped 41). [S903] Find A Grave - A User-Contributed Listing of Cemeteries and Memorials; Find A Grave Founder Jim Tipton, 2009; online at http://www.findagrave.com/cgi-bin/fg.cgi?page=gs&, Greenwood Cemetery, Superior, Douglas Co., WI. Leo Roy Sidles was born on 6 December 1913 at Huntington, Emmet Co., IA.2 He was the son of Jesse James Sidles and Jessie Amelia Ball. Leo Roy Sidles married Juanita B. Anderson.2 Leo Roy Sidles died on 1 December 1993 at Anaheim, Orange Co., CA, at age 79. [S3194] Richard Sidles, "Sidles Family Tree," database made available on-line courtesy of Richard Sidles, https://www.ancestry.ca/family-tree/person/tree/9915611/person/-219903389/facts, database viewed 25 July 2017. [S16] 1940 (April 1) U.S. Census, Wood River, Burnett Co., WI, ED 7-24, Sheet 6A (stamped 154). 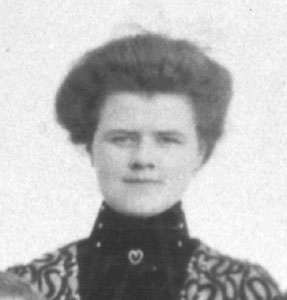 Ida Mae Ball was born in June 1883 at IA.1 She was the daughter of Edson Robert F. Ball and Rachel Fields. 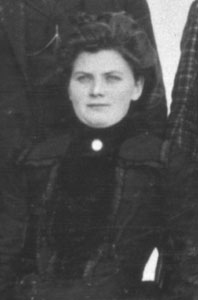 Ida Mae Ball married Leroy Marvin Scott, son of Winfield Job Scott and Mary Matilda McConnell, on 20 February 1907 at Maple Hill, Emmet Co., IA.2 Ida Mae Ball died circa 1936. Ida Mae Ball was also known as Mary. Photo courtesy of Martiele Sidles of Fullerton CA. [S14] 1920 (January 1) U.S. Census, Township 36, Bennett Co., SD, ED 3, Sheet 6B (back of stamped 109). [S15] 1930 (April 1) U.S. Census, Martin, Bennett Co., SD, ED 4-2, Sheet 1B (back of stamped 2). [S12] 1900 (June 1) U.S. Census, Eagle, Kossuth Co., IA, ED 145, Sheet 7A (stamped 182). [S16] 1940 (April 1) U.S. Census, Estherville, Emmet Co., IA, ED 32-12, Sheet 6A (stamped 142).